The huge earthquake and tsunami that hit northeastern Japan on March 11, 2011 dealt an unprecedented blow to Fukushima Prefecture, where the disaster was made worse by the release of radioactive materials from one of Tokyo Electric Power Co.'s nuclear power plants located on the devastated coastline. In response, the battered region came up with Project Fukushima, exploring the reality of Fukushima Now and prospects for Fukushima Future. Musician Yoshihide Otomo, musician Michiro Endo, and poet Ryoichi Wago – all native sons, and some are still resident in the prefecture – are the frontmen for this venture, which was launched in May 2011 and draws on the talents of many volunteers from inside and outside Fukushima. On August 15 of the same year, "Festival Fukushima!" was held for the first time, attracting around 10,000 visitors. The following year it was expanded into a "synchornized worldwide event." A host of other activities, including internet broadcasting station "Dommune Fukushima!," the educational "School Fukushima!" and a platform for sympathetic artists to share their creativity and fund-raising channel "DIY Fukushima!," have also been running continuously to help with the recovery effort. 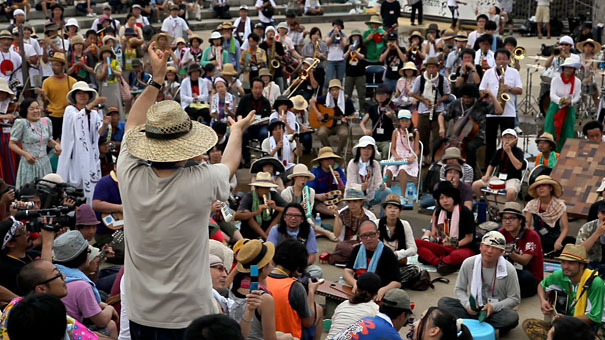 The Triennale will see them stage a participatory Aichi version of "Orchestra Fukushima!"